The best things in life truly come in threes as Alaska unveiled in "The Power of Tri: 3 Weekends, 3 Great Sports Events” Press Conference last May 16 at the Seda Hotel, Bonifacio Global City. The three sport events will compose of swim, bike, and run events – Alaska IronKids Philippines Aquathlon, Alaska Cycle Philippines, and Alaska World Milk Day Family Run. Alaska has teamed up with Cycle Asia, a network of premier cycling events and Sunrise Events to launch the Alaska Cycle Philippines whereFilipino riders willgear up for three days of thrilling bike action from May 16 to 18 with the children’s race happening on May 17 and May 18 for the adults. The event will cater to cyclists of all ages and abilities with different categories like the Tricycle Ride which is specially designed for young kids between ages 2 and 5, the Junior Challenge which is a more challenging category designed for older children where they have to ride as fast as they can within 30 minutes and then there’s the Foldies Community Ridewhich is catered to the popular folding bikes cycling community. The Alaska Cycle Philippines will also be a “Bike Ride Out”, meaning there will be no winners just plain fun to promote participation and most especially good health and an active lifestyle. 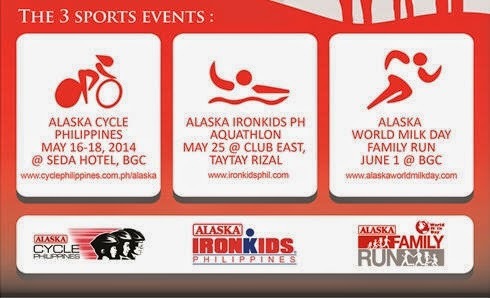 Alaska IronKids Philippines Aquathlon on the other hand will be held on May 25 at Club Manila East, Taytay, Rizal.Alaska IronKids Philippines is the local junior version of the international triathlon series, IronMan. The race is open to children six to 14 years old. On June 1, Alaska will hold the Alaska World Milk Day Family Run along 30th Street corner 9th Avenue at the Bonifacio Global City. Registration is open until May 25 and categories include 3K for individuals and family, 5K and 10K races. This event will be fun filled for the whole family and there will be series of activities and simultaneous events from different parts of the country. "We are excited to continue an active year of Alaska Sports with the launch of the three events Alaska Cycle Philippines, Alaska IronKids Philippines Aquathlon and the Alaska World Milk Day Family run. Alaska teamed up with international partners to ensure that Filipino families participate in sports activities as exercise to promote their health and ensure a wholesome lifestyle," said Uytengsu. The 7th National Nutrition Survey, done by the Food and Nutrition Research Institute and the Department of Health, showed that obesity is increasing with nearly two out 10 children considered as overweight. Under-nutrition is also a public health concern affecting nearly three out 10 children. Alaska promotes nutrition through its leading brands, Alaska Powdered Milk Drink and Alaska Chocolate Powdered Milk Drink and through educating the public about the importance of drinking milk and keeping an active and healthy lifestyle. Alaska promotes a holistic sports development program for the whole family and encourages a healthy and active lifestylethrough biking, swimming and running. It also helps in community development and nation building by nurturing positive values of teamwork, cooperation and fair play through sports activities like the Alaska Cycle Philippines, Alaska IronKidsAquathlon and the World Milk Day Family Run.